CD Genomics offers a comprehensive microRNA microarray profiling service based on some of the most powerful platforms in this field with unrivaled accuracy and sensitivity. 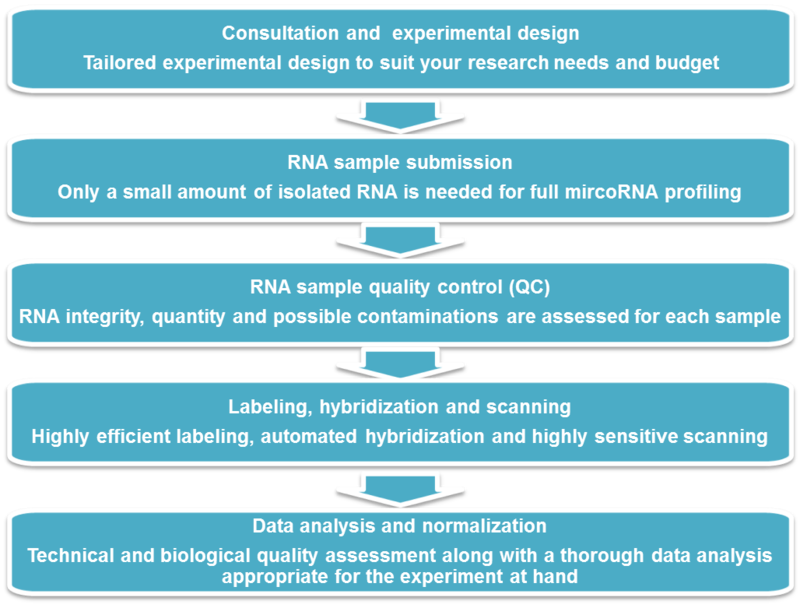 miRNA expression profiling came into prominence, in part, because of the expectation that a highly expressed miRNA for a given tissue or cell type (or a developmental stage) is likely to play a regulatory role.Let microRNA and microarray experts perform your analysis in automated laboratories with rigorous quality control and fast turn-around times and advanced data analysis tailored to your research needs and budget. Additionally, for each batch of samples, the customer receives a data summary containing a catalog of data files, images of representative regions of corresponding arrays, and descriptions of specific features of the arrays. CD Genomics can also help create your own custom miRNA microarray. We are ready to help you with your custom array needs, whether it’s a standard design or something more creative.